Turkish President: Trump’s statement on Golan Heights was an “election gift” to Netanyahu. Turkish President Recep Tayyip Erdogan announced on Sunday that Turkey will take the issue of the Golan Heights to the United Nations, Reuters reported. 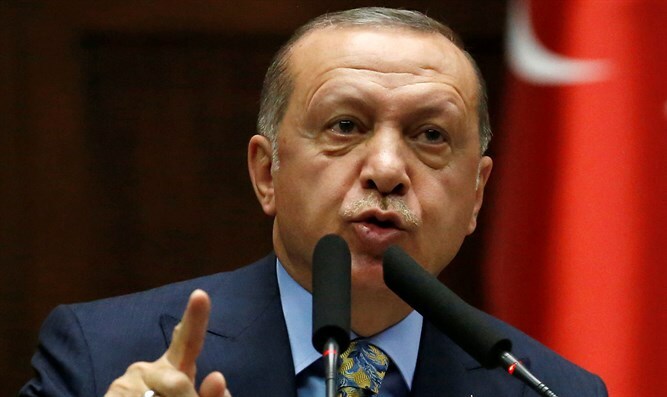 Speaking in an interview with local broadcaster TGRT Haber, Erdogan said US President Donald Trump’s statement on Golan Heights was a “gift” to Prime Minister Binyamin Netanyahu ahead of the elections in Israel. Last Thursday, Trump announced on Twitter that it was time for the US to officially recognize Israel's sovereignty over the Golan Heights. On Sunday, acting Foreign Minister Yisrael Katz announced that Trump will sign an executive order formally recognizing the Golan Heights as Israeli territory during his meeting with Netanyahu on Monday. Erdogan’s comments on Sunday came two days after he warned that Trump’s move would destabilize the Middle East and lead to “a new crisis” in the region. Speaking at an emergency meeting of the Organization of Islamic Cooperation, Erdogan vowed to pushed back on efforts to “legitimize” Israeli sovereignty over the Golan Heights, while claiming that US recognition of Israeli sovereignty over 500 square miles of the strategic plateau would lead to “more violence”. On Thursday, hours after Trump’s announcement, Turkish Foreign Minister Mevlut Cavusoglu wrote that recognition of Israeli sovereignty over the Golan would lead to “new violence” and “pain”.